Windows lets you create however many user accounts you want with just a few clicks. Just open the Settings app, go to "Accounts > Family and other people" and click on the button "Add a family member" or "Add someone else to this PC" depending on your need. Every time, you create a new user account, it will be added to the user's list and displayed in the Settings app, Control Panel, and on the Lock Screen. Apart from the user accounts you create, Windows has a few more default accounts that are hidden from plain sight. For instance, Windows has a built-in administrator account that is disabled by default, a guest account that is disabled by default, and if you are using Windows 10, you will also have a WDAGUtilityAccount account that is linked to and managed by Windows Defender to protect your PC. Not only Windows hides some user accounts so that you don't mess with system accounts, but it also hides advanced details like SID information, domain, SIDType, whether the user account has the ability to change the password, etc. If you want to see all the user accounts and full user account details in Windows, you can do that. Here's how to list and view full details of user accounts in Windows. I'm showing the procedure in Windows 10, but it also works in Windows 7 and 8 too. Just follow the steps as is and you should be good. 1. Search for "PowerShell" in the start menu, right-click on it and select the option "Run as Administrator." If you want to, you can use the Command Prompt to see full details of user accounts in Windows. 2. After opening the PowerShell window, copy the below command, paste it in the PowerShell window and press Enter to execute the command. Quick tip: to paste the command, right-click inside the PowerShell or Command Prompt window. 3. As soon as you execute the command, the PowerShell or Command Prompt window will list full user account details of all users on your system. 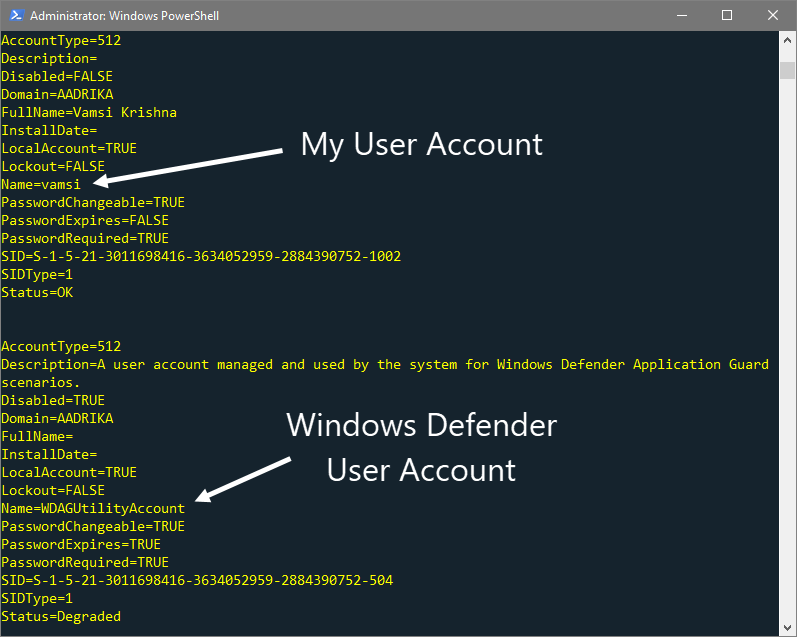 For those of you who are wondering, WDAGUtilityAccount is a Windows Defender user account. Windows Defender needs highest privileges to scan and remove any infected files from your system. So, it has its own user account. Don't touch it or mess with WDAGUtilityAccount. Also, did you know Windows Defender can now run in a sandbox for increased protection? Here's how to enable Windows Defender sandbox in Windows 10. What are all those properties in the details list? In the list, there might be some properties you might not understand, like AccountType for instance. So, let me detail some of the confusing jargon you see in the list. AccountType: This property lets you know what type of the account it is. You will see a weird number associated with this property. They are as follows. 512: Default or normal account of a typical Windows user. This is what you normally see when you execute the above-provided command. 256: Local user accounts who have their primary account on another Domain. As such, these accounts will have access to this domain only, not to any other domain. 2048: System domain account that also trusts other domains. 4096: System account that is a member of this domain. 8192: This is a system backup domain controller account that is also a member of this domain. Disabled: This property lets you know whether the account is enabled or disabled. You will see False if the user account is active and True if it is disabled. Lockout: Tells you whether the account is locked out or not. Generally, the account is locked out by the administrator or by entering the wrong password several times. SID: This is the Security Identifier (SID) of this account. Each account has a unique SID string. SIDType: This shows the type of SID. Depending on the value, you can know to which group the current SID belongs to. Generally, the user account you create belongs to the User group. Hope that helps. Comment below sharing your thoughts and experiences about using the above method to view full details of user account details in Windows.